In History's two-part, four-hour Special Presentation: Third Reich, rare and never-before-seen amateur footage tells the epic story of the Third Reich as it's never been told before: through the eyes of the people who lived it. The Rise ... A unique perspective on the rise of Nazi Germany and how millions of people were so vulnerable to fascism, told through rare and never-before-seen amateur films shot by the Germans who were there. The Fall ... How did the Germans experience the Allied victory in WWII? Rarely-and never-before-seen amateur films recount the catastrophic downfall of the Third Reich through the eyes of the people who lived it: the Germans themselves. Can a documentary pack a thorough history of Nazi Germany into 174 minutes? No, but a 2010 History Channel documentary gives it a shot. Reich indeed attempts to trace the rise and fall of the Nazis. It starts with the roots of unrest in post-World War I Germany and shows how Adolf Hitler gained a following and came to power. The program then depicts their work within 1930s Germany as well as their attempts at expansion later in the decade and the development of World War II. While Reich covers expected territory, it does so in an unusual manner. Rather than opt for the usual mix of talking heads, reenactments and archival elements, Reich goes exclusively with film shot in the eras depicted. We see nothing other than material recorded from the 1920s to 1940s. Reich also lacks the standard roster of experts. Instead, it uses actors to utter the words of historical witnesses. In this category, we hear from authors Sebastian Haffner, Peter Fritzsche, Friedrich Reck-Malleczewen and Erich Ebermayer, society journalist Bella Fromm, Nazi Party members Otto Bangert and Franz Buchner, school teacher Louise Solmitz, Brunswick resident Elizabeth Gebensleben, Berlin Jew Dr. Landau, literature professor Victor Klemperer, Reich Propaganda Minister Josef Goebbels, cigar factory worker �Emma�, Hitler Youth member Jost Hermand, American journalist Ernest Pope, Halberstad resident Else Klamroth, Berlin writer Ruth Andreas-Friedrich, 12th Infantry officer HG Klamroth, filmmaker Julien Bryan, German tank gunner Karl Fuchs, Hamburg resident Mathilde Wolff-Monkenberg, Osnabruck resident Dierk Sievert, Stuttgart resident Gretta Dolker-Rehder, Company Commander Lt. Reinhart, German infantry Willy Peter Reese, German officers Helmuth Groscurth and Karl Kretschner, Cologne resident Peter Fischer, 13-year-old Hamburg resident Hilke Clark, German soldier Heinrich Fromke, Berlin resident Dorothea von Schwanenfluegel, Laubach resident Friedrich Kellner, American journalist Meyer Levin, Dachau prisoner Edgar Kupfer-Koberwitz, and Berlin journalist Marta Hiller. We also hear from a mix of unnamed parties. In addition to the absence of the standard commentators, Reich goes for an unusual focus. While it covers politics and the war, it prefers the viewpoint of the average citizen. This means that we don�t learn about political maneuvers, specific battles or the like. Instead, we inspect the Nazi era from the ground level, which is both a pro and a con. On the positive side, this gives us a different perspective. God knows that this story has been beaten to death in its more conventional telling � and probably in less conventional ways as well. Still, the reliance on more �ordinary citizens� to relate the events and the absence of historians gives it a feel that separates it from most of its brethren. As does the exclusive use of archival footage. While we always see material of this sort, we don�t often find it featured to the exclusion of all else. This helps give the program a more immediate feel. To a degree, at least, as the �con� side of the coin ensures that Reich doesn�t totally satisfy. The main problem comes from editing and music. I�d like the archival footage and �you are there� comments to contribute a sense of realism, but the show is cut and scored in such a way to take us out of that realm. We rarely spend more than a couple of seconds with any particular shot, as the program moves at a rapid pace. Some of that�s necessary due to the scope � after all, it covers more than 20 years � but I still feel it shortchanges the footage. We get so much potentially valuable film but barely are allowed to see any of it. The score hurts the film more, for it usually takes on such an ominous tone that it would better fit a horror movie. Yeah, the Nazi story can be viewed that way, but the darkness of the music just doesn�t work; it tries too hard to dictate our emotions. And it never stops. I don�t think one second of the program comes without score; the music turns into a relentless partner. That would be a mistake even if I liked the score more, but since I find the music off-putting at best, its inescapable nature creates serious problems. 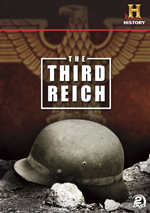 I still think Third Reich is a worthwhile project and something that will merit attention from those with an interest in this segment of history. Nonetheless, it disappoints me because of its execution; it�s too busy to give us an involving depiction of its events. The Third Reich appears in an aspect ratio of approximately 1.33:1; due to those dimensions, the image has NOT been enhanced for 16X9 televisions. I found it very tough to rate the picture due to its nature. Since the entire documentary consists of 65-90-year-old footage, I certainly couldn�t expect it to look very good. Quality varied quite a lot. Some segments offered fairly nice clarity and definition, while others came across as soft and mushy. The clips tended toward the latter more than the former, but plenty of exceptions occurred; a handful of genuinely appealing snippets appeared. 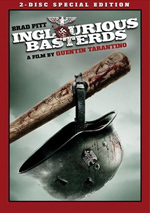 Still, most of the documentary looked about as good � or bad � as you�d expect. Source flaws were a virtually constant distraction, and much of the material appeared fuzzy and indistinct. During the occasional color elements, the hues tended to be faded and flat. Again, these weren�t constant concerns, as the program occasionally offered pretty nice visuals. Nonetheless, most of it stayed within the quality range typical for collections of archival material such as this. Because of that, I thought it earned a �C� for picture. I thought the Dolby Stereo 2.0 soundtrack of Third Reich was also acceptable and average. The soundfield had little going for it. Music showed decent stereo imaging, and that was about it. Effects came from the source footage and remained monaural. In any case, a documentary like this didn�t need a dynamic soundscape, so I didn�t mind the bland presentation. Audio quality was fine. Speech sounded natural and concise, without edginess or other problems. Music seemed full and rich, and effects were decent; they didn�t demand much of the mix, but they appeared accurate enough. This was a perfectly serviceable soundtrack for a documentary. My extras rating was simple. There weren�t any, so the set got an �F�. That was easy! With its emphasis on archival footage and first-person comments, The Third Reich presents something different than the average documentary. Unfortunately, it suffers from such poor editing and scoring that it shoots itself in the foot and becomes less effective than it should be. The DVD offers acceptable picture and audio but includes no supplements. This is a worthwhile rental for history buffs but not a genuinely strong documentary.